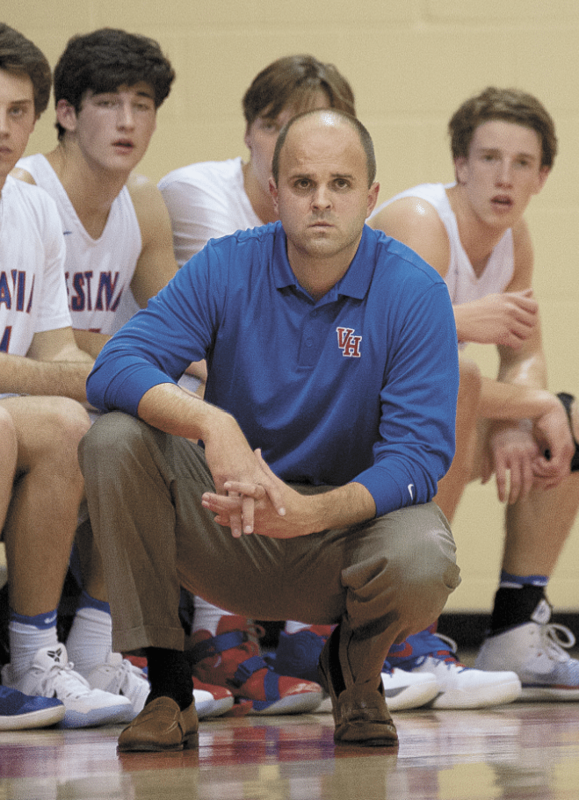 Vestavia Hills boys basketball coach Patrick Davis replacing George Hatchett, who won a pair of state championships in his three-decade tenure with the Rebels. Journal photos by Marvin Gentry. Patrick Davis knows what it takes to win in big-time high school basketball. He won 121 games in seven years as head coach of the Thompson Warriors, claiming three area titles in the process. For his efforts, Davis was named Coach of the Year in 2013 by the Birmingham Tip-off Club. Last spring, Davis took on a new challenge when he accepted the head coaching job at Vestavia Hills, replacing George Hatchett, who won a pair of state championships in his three-decade tenure with the Rebels. As November moves into December, Davis’ rebuilding plan seems to be right on schedule. Vestavia completed last week with a 5-5 record, and the coach sees ample reasons for optimism. A top priority for Davis has been installing the up-tempo style offense that was his trademark at Thompson. Early standouts for Vestavia have included junior guard Luke Champion, who is home-schooled and eligible for varsity play under Alabama’s new Tim Tebow Law. The legislation allows home-schoolers to participate in Alabama High School Athletic Association-sanctioned sports. Senior Mac Smith was the Rebels’ leading scorer last season, averaging 11 points a game. He’s missed five games with a turf toe injury in 2016, but Davis expects him to be a major factor once he’s healthy again. Another player to watch is junior point guard Scott Morrison. 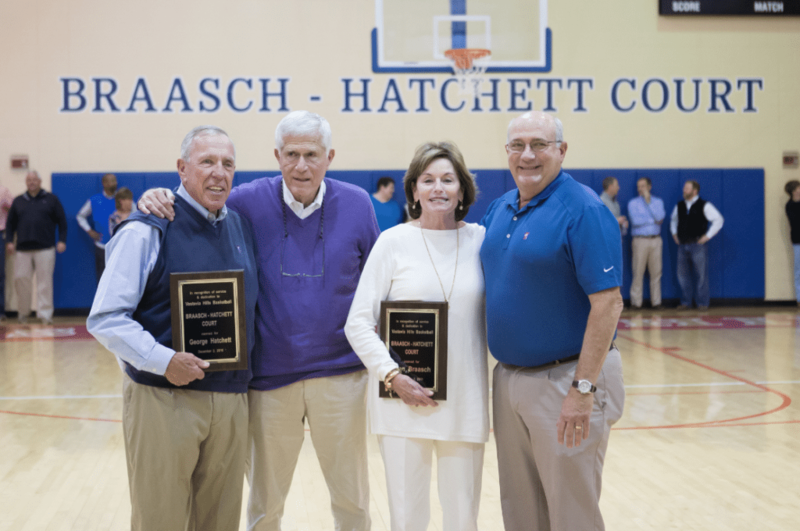 The Vestavia competition gymnasium was officially named Braasch-Hatchett Court recently after long-time Rebel girls basketball coach Fran Braasch and Rebel boys basketball George Hatchett. Attending the ceremony were former Vestavia principal Michael Gross and Vestavia head football coach Buddy Anderson. As is the case with many coaches, Davis believes in playing a rugged non-area schedule. Vestavia is aligned in Class 7A’s Area Five with Hoover, Thompson and Tuscaloosa County. Davis said his first year at Vestavia is different from his inaugural campaign at Thompson years ago. There are similarities between the two communities, he added. Davis is impressed with the spirit he sees daily at Vestavia, not only among the athletes and student body, but also among his fellow Rebel coaches. That camaraderie among coaches was reflected recently when the Vestavia competition gymnasium was officially named Braasch-Hatchett Court after long-time Rebel girls basketball coach Fran Braasch and Hatchett. Davis said he had win-total in mind for his first Rebel team. “This sounds like a cliche, but our goal is to be the best we can be every time we go on the floor,” he said. If Davis can do that, he could well be one of those coaches that stays at Vestavia for a long time.